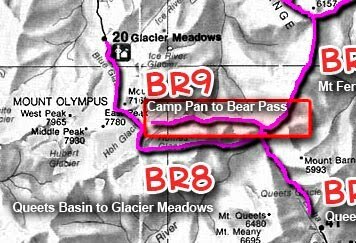 The standard route between Camp Pan and Bear Pass is to descend into Queets Basin via the Humes Glacier. An alternate route was successfully attempted in early July 2007, maintaining the high ridgeline between Camp Pam and Bear Pass. This traverse is not in the 4th edition of the Climber's Guide. For more photos and description, see Steph Abegg's July 2007 trip report. On the east end, this traverse can be linked with BR6 (Mt. Ferry to Queets Basin) or BR7 (Queets Basin to Elwha Basin). On the west end, this traverse joins the western half of BR8 (Queets Basin to Glacier Meadows). See the published Climbers Guide for detailed approach information. From Camp Pan, head east, keeping on the ridge above the Humes Glacier and circling around the south side of Aphrodite (Class 3). When the ridgeline is regained, the ridge will be quite steep to the south. Stay on the north side and descend several hundred feet into a basin (snow-covered in early season). Look for a notch in the ridge to the east, where the steepness of the basin walls lessens. Getting to this notch might involve a curious mixture of loose and compacted talus, unless snow-covered. From the notch, make a slightly descending traverse around the north side of a peak on the ridge around to Bear Pass. Time: 2.5-3 hours in early season. This route could be reversed. (Note that mid- to late-summer might present unforeseen route-finding challenges). Nearing Bear Pass on the ridgeline traverse, July 2007. Photo by Steph Abegg.